U.S. Naval Academy reinstates celestial navigation education. 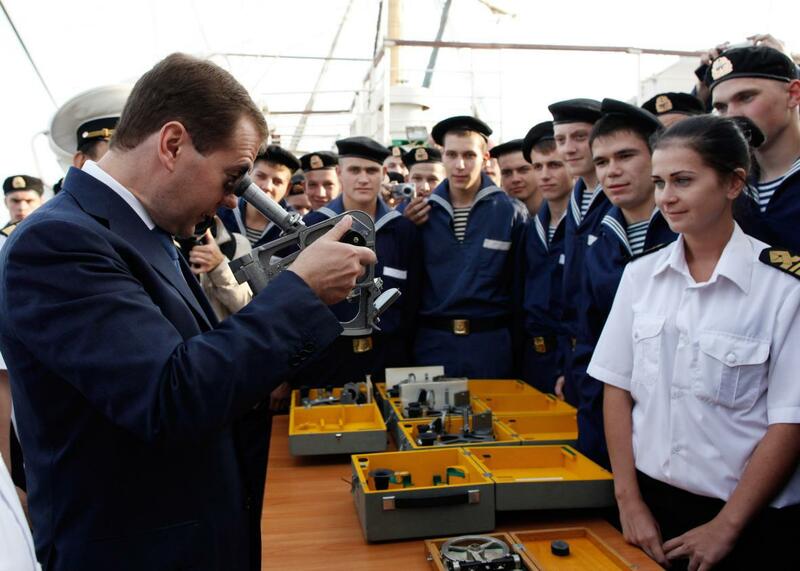 Russian Prime Minister (then-President) Dmitry Medvedev uses a sextant in 2011. Protecting critical infrastructure from cyberattacks is an ongoing concern, whether you’re thinking about the electric grid, ports, water treatment plants, or anything else. And a curriculum decision by the U.S. Naval Academy in Annapolis, Maryland, is a reminder that the same fears exist for the Global Positioning System. After almost 20 years of teaching students to rely primarily on computers, the Naval Academy is starting to ramp up celestial navigation training again. When the school originally phased out its notoriously difficult celestial navigation course in 1998 (it had been taught since the academy’s founding in 1845), analog advocates freaked out. “The reports set off an outpouring of laments, including an editorial in The Times, about how unfortunate the loss of the sextant would be, and how valuable it could still be in the practice of celestial navigation, even in an age of computer technology,” a May 1998 New York Times piece explained. The Naval Academy didn’t bring back a full course on navigating by the stars this year, but it is offering a three-hour introductory session to help familiarize students with the old-fashioned tools, so they could turn to them in an emergency. School officials say that they may expand the program. The Gazette reports that the academy is concerned about everything from one-off incidents like a malfunctioning GPS receiver on a particular ship to a full-scale cyberattack on GPS. It may sound romantic to look to the stars in times of trouble, but it seems like a wholly practical decision to make sure someone in the Navy knows how to navigate without GPS if the lights ever go out.